Support our youth programs by becoming an event sponsor! This is a great way to support environmental education for Maui’s youth while also reaching hundreds of people in our Maui community via our events, social media promotion and YouTube channel. Sponsor the Huliau Food & Film Festival to be part of our annual farm-to-table benefit dinner! 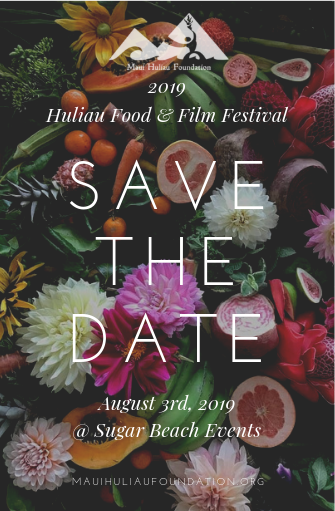 Huliau Food & Film Festival is a farm-to-table celebration of local agriculture featuring local chefs and student-produced films. Our 2019 event will take place on August 3rd at the stunning oceanfront Sugar Beach Events venue in Kihei. Please see the event sponsorship information below or contact us at info@mauihuliaufoundation.org or (808)757-2100 for details at any time. Sponsors who confirm by May 14th will also be recognized at our Huliau Youth Environmental Film Festival on May 19th! Sponsor Huliau Food & Film Festival! Click here for on-line sponsorship form! Mahalo to our 2018 main and secondary sponsors!